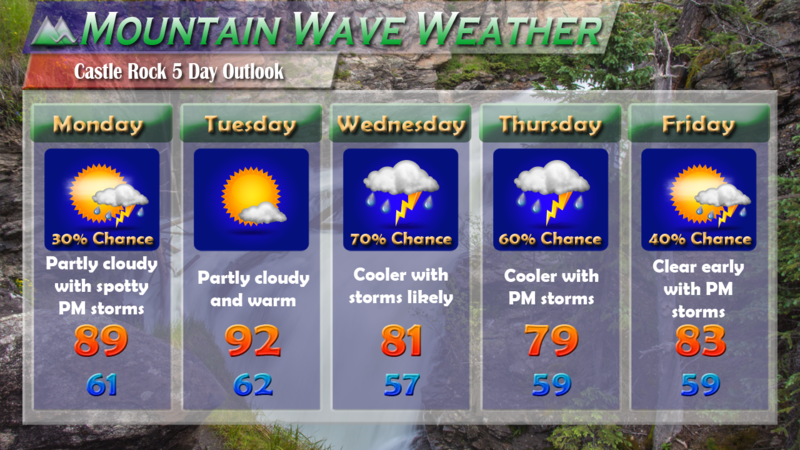 More Hot Dry Weather Headed Our Way! No doubt about it, this is the hottest time of year for most of Eastern Colorado including Castle Rock. Our average high temperature during the day is 86 degrees during this time, as you can see from the forecast above the first half of the week will be slightly to well above average. A stronger cold front moves through lat Tuesday and cools the area down substantially Wednesday, Thursday and a bit on Friday. 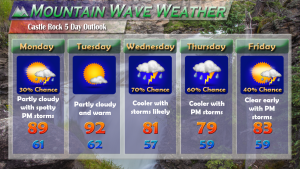 The other good news is that due to our high pressure ridge shifting Eastward along with a shift in winds and influx of cooler air, storms with measurable rain look likely during the second half of the week. 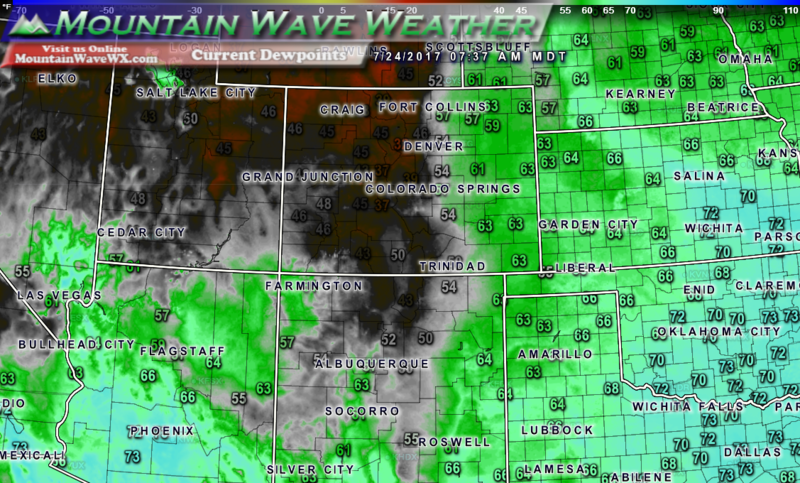 You can even see evidence of better moisture in the air today as dew points are up across Eastern Colorado. 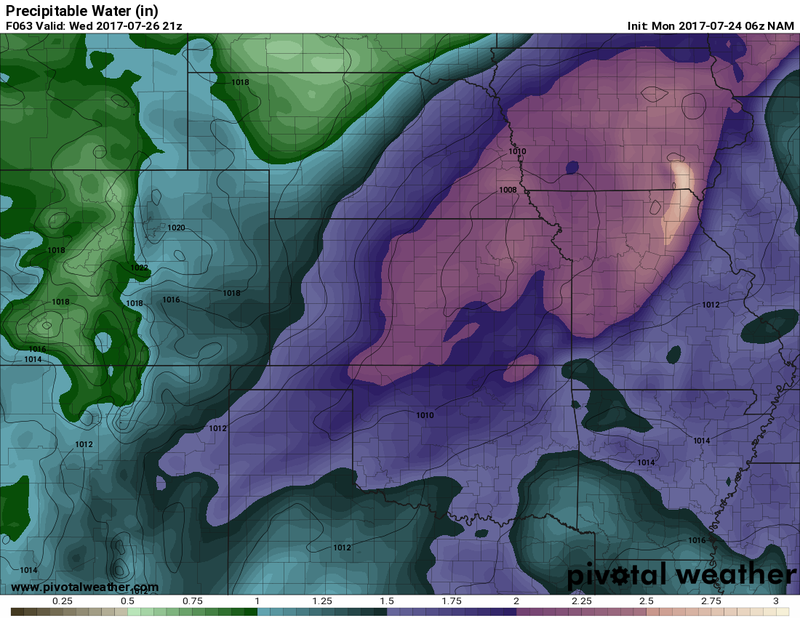 Looking ahead to the middle and later part of the week we can see a further increase of moisture as precipitate water values approach and in some cases surpass an inch. This is basically a measure of the amount of water in the atmosphere, it doesn’t necessarily mean we see an inch of rain. Generally the higher this value is, the more rain we see if all other ingredients come together for storms. For reference it has been around the 0.5 inch range for the past week or so, occasionally jumping to 1 to 1.25 inches. Precipitable water is a measurement of water in the atmosphere. We like to see higher values if we want to see better chances for rain. 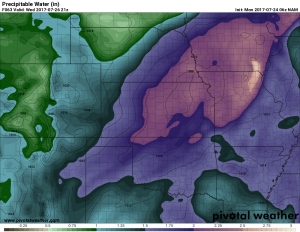 Do PWAT values drop, meaning less water for storms to work with? Could interrupt the transport of moisture into Eastern Colorado meaning less chances for storms or lower storm coverage overall. We’ll keep a close eye on it and update the forecast as necessary throughout the week. I’m not sold just yet on the 70% + chances for storms starting mid week until we get a bit more data in.